Ari and Gage experience their mother's death and are taken in by her old friend, Janna, someone they hardly know, and raised in a very different way. It becomes too much for Gage as the older brother to be not trusted and unloved. His mother's wishes were for the two of them to stay together so when he feels like it is time to leave he takes Ari with him, even though it means lying to Janna. He does not have an apartment arranged or a job for himself. He and Ari take turns staying at shelters and friend's apartments. Hiking their way around the city and trying to get Ari to school everyday is difficult for both of them. Ari lies to her teachers, her classmates, and her best friend about how she is living. Her teachers watch her slip behind, coming in with her unclean and stinky clothes and hair. She struggles to get homework turned in and her friends make fun of her. As an educator I wanted to stop her in the hall and ask if all was okay, how can I help? This well-written realistic fiction shows the difficulty of homeless children. How do you keep your stuff together, how do you take a shower, how do you keep your life from falling all apart and still love and trust the brother who put you into this situation? This story should help anyone gain more empathy and compassion for students in this situation. 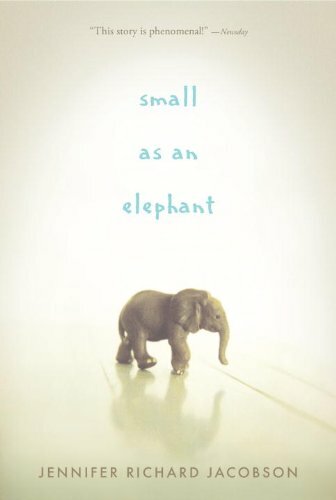 Jennifer Richard Jacobson is an eduator as well and I've heard great things about Small as an Elephant. I'll have to get that one at the library as well. Thank you, Tina, for the recommendation.